Colin Chapman’s famous mantra has been the inspiration for the new Cormate Utility 23 series. 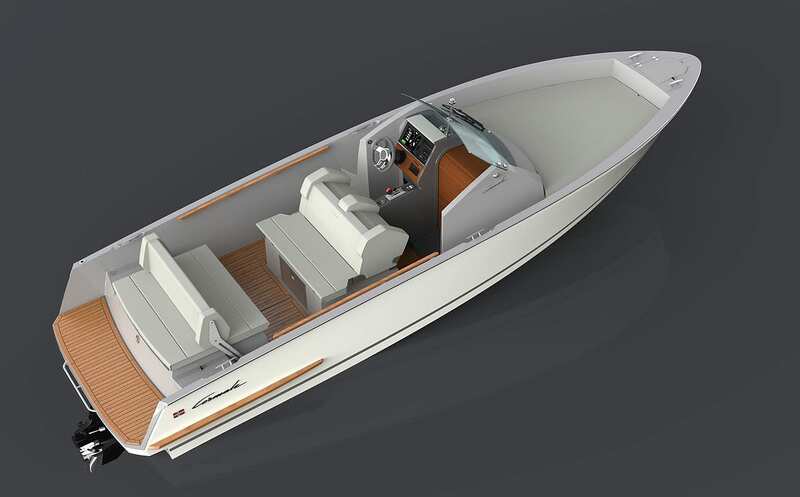 The aim has been to create a simple and minimalistic boat, but with quality, finish and details that belongs at the top level of the premium class. This is true Cormate quality in every detail. 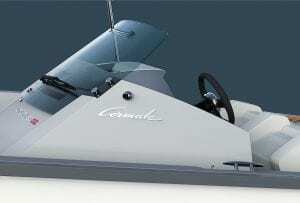 The extreme efficiently of the Utility 23 has been made possible by simplifying and lightening all parts of the boat. There are no unnecessary panels and every square centimeter of laminate is designed to be minimized, yet the outside areas are larger than on many other boats in this class. Needless decoration or „design gimmick“ is completely absent. Here, it’s all about efficiency and function. Although simplification has been prioritized, the hull itself is highly advanced. Never before have Cormate boats racing genes been more apparent. Extremely low weight and a new and revolutionary central ventilated „Monostep“ (developed by Cormate) provides an efficiency that until now has been impossible to achieve with this size and type of boat. By this central ventilation of the step through the self-drainage system (one of many double functions) it was possible to construct a much shorter and narrower step than normal. 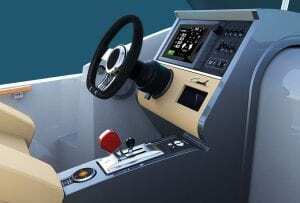 The Monostep construction reduces the risk of oversteer and „Spin Out“ at high speeds, a well known drawback on some stepped hull constructions. By making the last part of the bow straighter, the hull’s effective water length is increased, but not to the extreme that the bow’s angel of attack does not provide enough hydrodynamic lift when diving in to large waves – or making it difficult when going ashore on rocky shorelines. 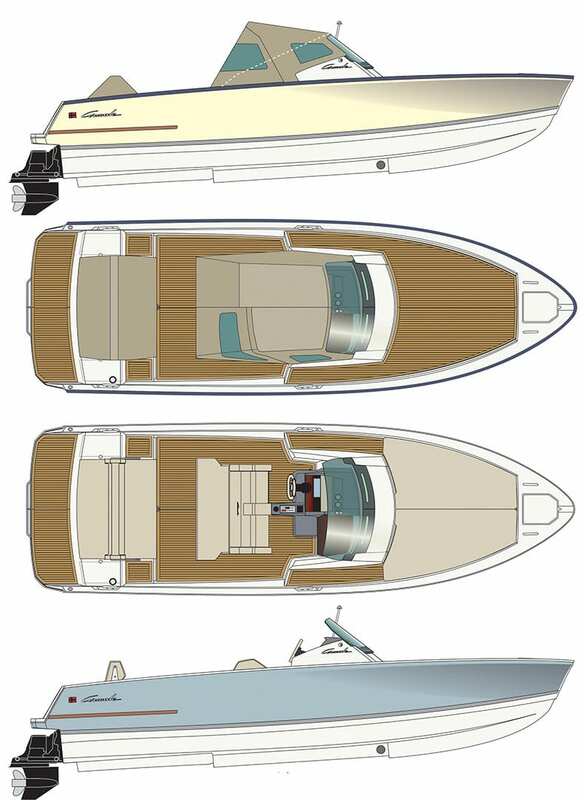 Utility 23 also has an aggressive delta-bottom construction (hull width decreases fast toward the bow), but has still a relatively moderate deadrise progression compared to many other modern hulls. 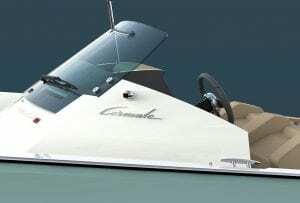 The combination provides a precise and soft ride without an unforgiving „double rudder“ effect. This further reduces the risk of the bow to oversteer in following swells or a „Spin Out“ at high speeds. 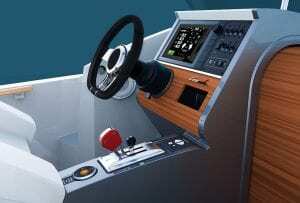 The boat has several cockpit/deck lockers. In the bow it’s an anchor locker with space for ropes and bow anchor (bow windlass is optional), on each side of the activity platform there’s one locker for easy access to anchor and rope (windlass is optional) and one locker with an easy-to-reach row of three fenders (an extra inflatable fender package is optional). In the front seat module there is a big luggage compartment and one locker for boat covers and one for ropes. Integrated 35L stainless steel compressor cooler is optional. There is also an optional mahogany table with pedestal, easy to reach and permanently stored to the backside of the seat module bench. An optional Mini propane gas grill can be placed in center of the table for social barbeque/cooking. A quickly mounted canopy is an optional item (with wiper kit), and a permanently placed stainless steel canopy rail is elegantly integrated to the design, the fabric is easily stored under the floor panel in the cabin. Slows down the motions of the hull and adds more sideways stability (larger moment of inertia and lower center of gravity). Both at rest and in very high speeds this is very evident compared with an outboard engined boat.